Chairman of the Senate Committee on Agriculture, Senator Abdullahi Adamu (APC, Nasarawa) yesterday said no amount of intimidation would stop him from supporting President Muhammadu Buhari. He said it was unfortunate that lawmakers of the All Progressives Congress were sabotaging the President. 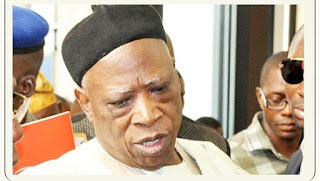 Adamu was on Thursday accused by Senator Obinna Ogba (PDP, Ebonyi) of plotting to destabilize the Senate and remove Senate President Bukola Saraki from office. Adamu in a statement he issued last night faulted Ogba’s claim. He said his crimes were the call against show of disrespect to the person and office of the President and his position on the change of election sequence. “Our party, APC, has the majority in both chambers of the National Assembly, yet we hold the Executive prisoner of politics that are unhealthy for the polity. It is such a terrible irony that we sabotage our own government by refusing to do our part in support of the Executive. “Appointments requiring Senate approval are held up. The consequence is that the public has nicknamed the President and his administration go-slow. The people gave us the mandate as a party to deliver,” he said.